The Bermuda Audubon Society today [Apr. 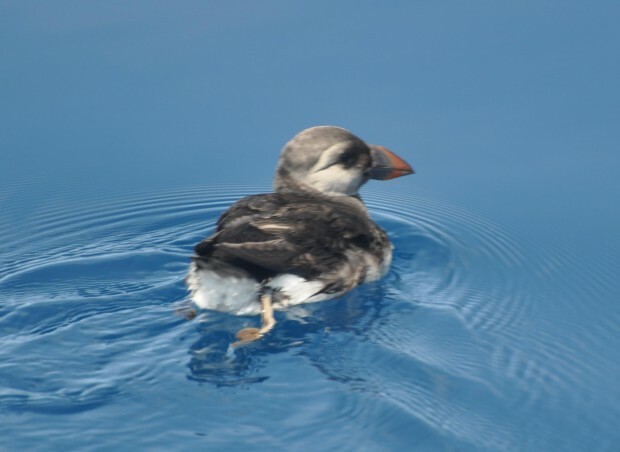 16] confirmed the first ever live sighting of an Atlantic Puffin in Bermuda waters — and posted the photographic proof at its Facebook page. The Atlantic Puffin is a seabird species that feeds primarily by diving for fish, but also eats other sea creatures, such as squid and crustaceans. Its most obvious characteristic during the breeding season is its brightly coloured bill. The curious appearance of the bird, with its large colourful bill and its striking piebald plumage, has given rise to nicknames such as ‘”clown of the ocean” and “sea rooster”. The Atlantic Puffin is the provincial bird for the Canadian province of Newfoundland and Labrador.